When I sat down to design my convention swaps, I played around with the new Zoo Babies set. I like to design holiday cards if I can because we always need ideas for the holidays. This wasn't quite what I wanted so I didn't go ahead and make it into a swap card, but I do think these animals will make a great Valentine. Here's my last convention swap. You may remember seeing a similar card on my blog recently. I liked it so much, I redesigned it just a little and made 25 to swap at convention. Here's another one of the swaps I made for convention using the new Wishing You set from the upcoming holiday catalog available August 1. I know I like to get holiday cards as swaps and figured some of the other ladies might too! I also used the Season of Style Designer Series Paper Stack which is great for Christmas cards. There are 48 sheets total but only 2 designs. So there are 24 sheets of 2 designs so it's easy to make them all the same. I'm back from convention and still catching up on my sleep, but I had a great time with 5,800 stamping friends. I used the Tape It and the Tag It stamp sets for one of my swaps. We received the Tag It set as one of our free sets from Stampin' Up, but I couldn't wait and ordered it as soon as the catalog was available. I thought it would be a good swap since everyone was going home with that set. Here's another card I made with the Blooming with Kindness stamp set after the Mr. & Mrs. card from yesterday. It's hard to see in the picture, but I embossed the card with the Framed Tulip embossing folder before stamping my flower and greeting. Such a pretty stamp! I colored the flower from the Blooming with Kindness stamp set, and then stamped my Mr. & Mrs. stamp over the top. It's not a very involved card, but I don't think it needs anything else. One of the first sets in the new catalog I knew I had to have was the Tape It stamp set. As I was experimenting with ideas for my convention swap, I decided I wanted to do one with the faux-washi tape look. This isn't the card I decided to make for my swap, but it was a fun little experiment that I will have for a special occasion. It also gave me a chance to use my new Zoo Babies stamp set! With just one stamp, this swallowtail image fills a card in a pretty dramatic way. I didn't order it at first when it was in the seasonal catalog, but I am sure glad I did after making several cards with it. Here's my first card. I used the Finishing Touches Edgelit along the bottom to add a little interest, but then you can see in the bottom image that I didn't stop there. We made this card at my last stamp-a-stack, and people seemed to like a variety of glittered and non-glittered depending on the occasion. It's hard to tell, but this cute little jar is full of buttons. 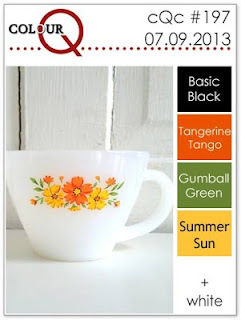 I was looking for a quick little Stampin' Up gift and the Kind & Cozy stamp set made it easy. The gingham ring fits the jar lid perfectly, and all I had to do was dress it up with a piece of Costal Cabana ribbon. Isn't this a beautiful technique? I first saw it on my friend Julie's blog. By reusing the same 2 pieces of Delicate Details Lace Tape and a sponge, it's easy to create this amazing background. Because the tape can be gently removed, place both pieces on white cardstock. Then with a sponge, rub your two different colors of ink over the tape without going too far off the second piece. Then remove only the first piece and place it next to the still stuck piece. Continue to leapfrog these pieces across the card as you rub on ink with the sponge. You can even save the 2 pieces of tape for another card! I finished the card and added a flower made with the Simply Pressed Clay. For the leaves, I stamped the flower from Kind & Cozy and it was a perfect fit. If I had to pick my favorite new in-color, Strawberry Slush might be it. Who am I kidding? I love them all. In fact, with the color refresh, I am using all new colors all the time! Some in-colors of the past have come back as permanent colors and have created all sorts of wonderful new color combinations. I'm pretty sure I have some Strawberry Slush flowers in my garden so why not pull out my new Gifts of Kindness set? I like the flower in this set, but the added bonus is the nice variety of greetings. I will get a lot of use out of this set! I'm having some fun with challenges this week - this one is from ColourQ. I knew which stamp set I wanted to use the minute I saw those colors - the Happy Hour set is perfect for summery drinks. Many times I try to make my stamping do double duty, and if I make a card I want to use it for an upcoming event. This week as I have been working on these challenges, all I worried about what following the rules of the challenge. It's really helped get my creative juices flowing again so I can go back and tackle my convention swaps. I have one set finished and another set designed, cut and ready to be assembled. I like a variety and usually design 2 or 3 swap cards. We'll see how the creative juices are flowing and maybe I will design one more. Check back in a few days if you'd like to see what I came up with. When I return from the Stampin' Up convention I will have a busy stamping week. I will be hosting my monthly scrapbook club, my annual Christmas in July Stamp-a-Stack and my garage sale. Convention is so much fun, and I will be so full of ideas and inspiration that I will be sure to have some great ideas for cards. I have pre-ordered some of the new holiday stamps from the holiday catalog coming out in August, but they aren't here yet. 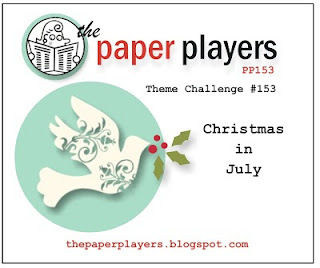 So when I decided to played along with The Paper Players Christmas in July Challenge, I had to get creative. This stamp set lends itself to ornaments, and I have had customers call it an ornament stamp so none of them will be surprised to see me use it for Christmas. I've been creating away in my craftroom these last few days, but once in awhile I do need a little inspiration. So this afternoon I went searching for a sketch or color challenge to play with. 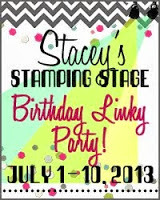 My friend, Stacey, is hosting a birthday linky party over at Stacey's Stamping Stage so I decided to make a birthday card. I also used the Mojo Monday 301 sketch to help myself get out of the box a little. So I broke out two new products - Cycle Celebration stamp set and the Birthday Basics DSP - two of my new favorites! Happy Independence Day. Here is a scrapbook page I made a few years ago to fit the theme of the day. Click here for full details. 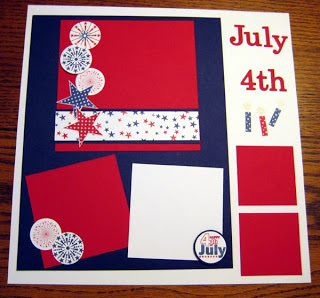 Also if you are interested in another 4th of July project, click here. I have been seeing these tri-fold cards for awhile now, and I decided I want to try one. This was also a chance for me to use the new hostess set, Morning Meadow, and new Afternoon Picnic DSP. I liked the look of the new Very Vintage Designer Buttons with a thin piece of cardstock to make it look like thread.